Yet another grey day - or at least morning. We went on the No 1 Vaporetto past St Marks Square to the Arsenale - which is the huge area to the east of Venice where the navy has been based and still seems to reside. 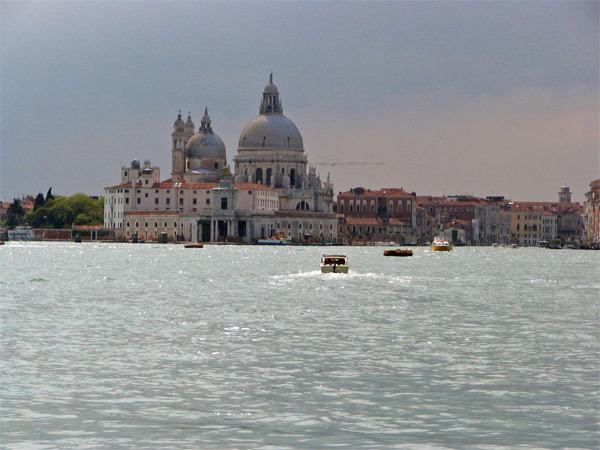 The waterfront area there provides a great view of (from left to right) the San Georgio Maggiore (the monastery island), the Giudeca (a long thin strip), and the Dorsoduro with the Salute and Dogana at its tip - plus the entrance to the Grand Canal. 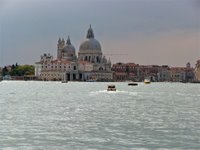 If you came from Marco Polo airport and paid for a water taxi and asked them to come around so you enter Venice from the Grand Canal this is the view you would get as you first see Venice. I spent a long time stitching photos and scans to produce the next lot of images produced. This is the view I had from sitting on a marble slab seat just to the right of the Arsenale Vaporetto stop. It's two paintings - intentionally done as a diptych - and stitched together to see how they look as one. These are two identically sized drawings (A4) on Canson Mi Teinte (mid blue colour) paintings. Bear in mind this was all completely eyeballed, no tracing, no photos, no nothing. I do confess to measuring the line of the water to make sure it would be at the same height in both pictures! I then intentionally shortened the long thin line of the Giudeca and added a bit more in to the left of San Georgio Maggiore. Celadon Green came into its own for the water which was exactly celedon green colour rather than the greyer colour in the photo. These two paintings probably took about an hour each or maybe a little bit more. The tricky bits were getting the relative proportions of the buildings right (and I was a bit out there with the height of the campanile on San Georgio) and getting the cross over right on the sky and clouds and the water. I really, really enjoyed doing that sky but was quite frustrated by how the blue Canson muted the colours very significantly so after stitching the scans together last night I tried to tweak the merged image ever so slightly in Photoshop to get closer to what I had been trying to do and was amazed at what came out - which is below. This also shows up my 'mark-making' much more clearly - and is much closer to the idea in my head - hence the reason for showing it to you. And this is the under-stated version. The 'full on' auto tweaks made the image even stronger! Finally, to close Tuesday morning's activities, here's a close up of the Salute from where I was sitting (with the entrance to the Grand Canal to its right) - and this is probably one I'm going to have a go at - but take my time over - as I love the colouring of this one. Click on all images to see larger versions. a terrific new blog Katherine, congrats!